Virtual Reference and Instruction: What is it really like? I just posted my proposal for the Library 2.0 conference. 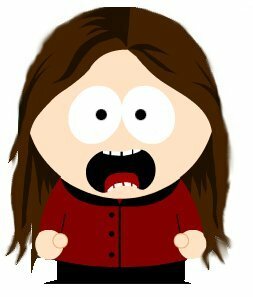 I would like to discuss what it is like to be an online librarian. A lot of people talk about providing online reference at the reference desk, but our methods are completely different, and very dynamic. You to have a certain personality to provide reference services in the first place. Then, to be in a fast paced environment where reference is coming at you from every direction is a different story! Why CCC faculty love to teach! I agree with so many of the faculty in this video. You learn a lot from the students, and it is a pleasure to see the light bulb go off. When the student has reached a level of understanding that astonishes them. It is the greatest reward. I love library instruction! It gives me a high. It is official I am in love with library instruction. Those close to me in my personal life suggested I teach. I knew I was not cut out to be a school teacher! I did not give up, and there were no obstacles for the next library class. I was so excited! Today, I visited my first virtual classroom and it went well. I taught students how to find resources for their business law. The professor was even excited we had e-books! I am feeling really good right now. Today, the library is buzzing. The study tables and group study rooms are full, and almost every computer is occupied. I came in the door this morning and there were students at the reference desk and circulation. This rarely happens, because there are so few classes held on Friday. Next week, is the last week of the semester, and everyone is trying to finish those last few assignments. A student was going around campus asking random people to record a happy birthday message for his friend. So, I wished her a happy birthday. Immediately after that a student comes to the circulation looking for a book on reserve for her class. She does not know the name of the book, the course name or number, or her professor’s name. I told her to get some more info, or go find her instructor to get the information. The professor comes back and gives us the title of book, but we cannot find it. It was shelved incorrectly. A student comes to the desk and insists I help her. She refuses the other librarian’s help. I guess I helped her before, and she liked the result. Her paper is due at 11pm. She does not have a thesis. So, I have to dig it out of her. In class they discussed U.S. influence over Brazil’s economy, and she read it in her textbook. I went to the textbook on reserve, and showed her the bibliography. We found some New York Times articles in the database, and books on our shelf. (I was shocked to find the books.) Since, we had some keywords we continued to search the databases, and found an abundant amount of information. As I was typing this blog posting a returning student looking for a Spanish-English dictionary wants to know if we still have it behind the desk. It was re-shelved, and he did know how to use the library catalog or find books using the LC call number system. He was not happy. I made him search the library catalog, and find the book on the shelf. He was frustrated, but in the end he thanked me. I think he was happy he did it on his own. I told him I am about teaching students how to find materials, and not just giving it to them. Now, I have an APA/MLA workshop. Happy Mother’s Day to all the mothers out there! Will the flyers and email announcement work? A student signed up for Friday’s workshop, but did not show up. No surprise. Fridays are very quiet on campus. I have no plans of doing a workshop on a Friday ever again! Friday I put tent signs on all the study tables in the library to advertise the workshops. My supervisor sent an email announcement to the person that sends announcements to students and faculty. Hopefully, she will send it out in the next day or so. People signed up for my workshop! I had this horrible feeling last night as I was preparing for my workshops, that not one student would sign up. I dreaded looking at the sign up sheet this morning. I know some of the students need help writing citations and creating PowerPoint presentations. Wednesday I spent an hour helping a young lady create 3 slides. There are only a few classes if any held on Friday. So, I was hoping I would get the people really struggling, or have assignments due today. 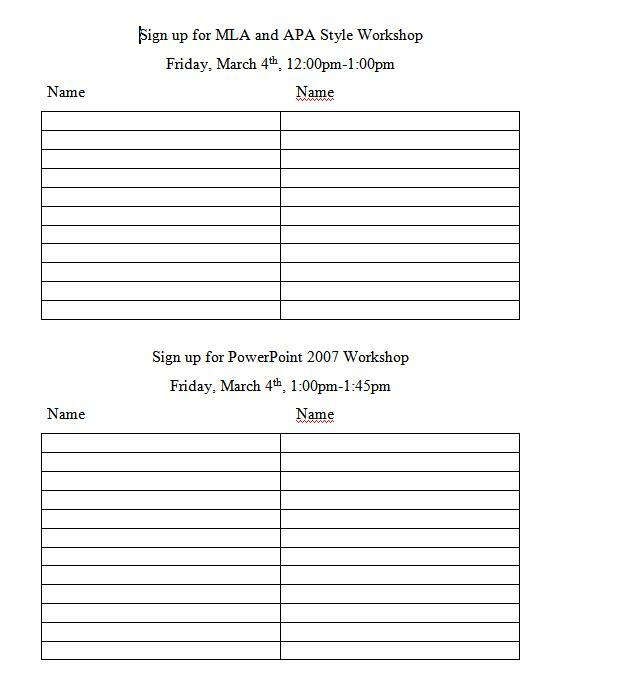 My worries were set aside when I saw that one person signed up for the PowerPoint 2007 workshop, and two people for the APA and MLA style writing workshop. Fridays are really dead, and the reference desk is slow. I had one tour of the library so far. Working part-time I have few responsibilities, and these workshops will keep me busy, help the students, and give me more experience. I am really happy they signed up. Lets see if they show up on this rainy day! I think I lost them! My second instruction session went fine. It did not go as well as the first. The instructor was sitting in the back of the room on a computer. Some the students were talking. We were in the computer lab. So, I walked up and down the aisles to make sure they were following me. We searched the library catalog, I showed them subject headings, and we searched the Literature Resource Center database. The class was English 101. I created a blog, and discussed the more relevant databases we subscribe to at Wright. Here is the blog I created http://libraryorientation.wordpress.com/recommended-databases/. We discussed e-books, and how to search the library catalog for them. I showed them how to find full-text and scholarly journal articles in the databases. I gave them a library tour. They were really into the New York Times on microfilm dating back to 1851. One student wanted to take a look. They have an assignment where they have to print out a page from our set. What made this session strange is the instructor’s insistence that I show the students reference books. Of course, I kept publicize our electronic databases which contain encyclopedias such as Gale Virtual Reference Library. She did not like this. So, I pulled books of the shelf. I showed them encyclopedias about religion, Chicago history, you name it! She wanted the students to make a list of 25 random reference books. I asked if she wanted me to help them search the library catalog to find item in the computer lab. She said she wanted them to walk up and down the aisles. I really lost the students when I started to pull books off the shelf. During this instruction session the students were talking to their neighbors. So, I have decided to break the students into groups. They will search for books and articles. I created a library exercise on my library orientation blog. Hopefully, this works out the next time. I will let you know how it goes. I started to give instruction sessions to students a couple of weeks ago. My first session went well. They were foundational students that needed to know the basics. They needed to know how to log into Blackboard, get their assignments, post assignments, comment, and send their classmates email. A few of them did not know how to access their email. So, I showed them where to log in on Wright College’s website. This was necessary because their professor would be sending them emails about the course. I gave them a tour of the library which went well. At first a few of them were talking, but as I got more involved they started to pay more attention. Luckily, they had an assignment so it made it easy to show them how to search the databases and library catalog. The assignment was African-American biographies. I taught them how to search Biographies Plus Illustrated for background information and peer-reviewed articles.